COLOGNE, Germany, April 3, 2019 /PRNewswire/ -- Today, Sony Startup Acceleration Program (hereafter "SSAP"), sees the launch of its second business in Europe: Advagym. 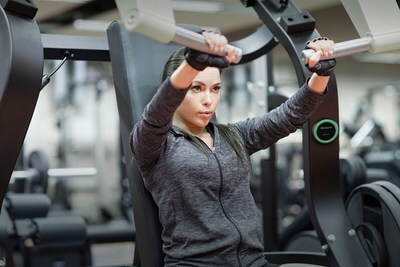 This smart gym solution is being showcased at FIBO 2019, the world's biggest trade show for fitness, wellness and health. Advagym is actively used at gyms across Europe and allows them to retro fit on any of their existing equipment and transform them into digital gyms overnight. Advagym, after having gone through technical and commercial trials, is the second business launched in Europe by SSAP which creates start-up projects and supports their business operations. Advagym uses a time-of-flight sensor on strength machines to record repetitions, sets and speed of motion. Users simply touch their phone to the sensor 'puck' to start tracking their workout in real time, with statistics automatically uploaded to the Advagym app. Pucks in free weight areas enable users to select the course from a list of exercises or create their own, while pucks on functional training units link to videos and step-by-step instructions of suggested workouts. The Advagym app is free to download for Android and iOS users enabling them to log their favourite workouts and preferred machine settings, add free weight workouts, set up their own training plan, and view their complete workout history. Advagym also enables personal trainers and gym staff to increase interaction and communication with users and boost motivation by creating customised training programs and providing feedback on progress. Gyms can use the solution to monitor use of equipment and gain valuable insights into user preferences. Advagym is easy to install, without cables or interference with any other gym equipment, and is equipped with a long-life battery lasting several years. This smart gym solution is working as an open source platform, giving members, gym staff and personal trainers access to the whole database. Henrik Bengtsson, Senior Business Manager, Advagym, says: "Advagym helps gyms attract new members and keep members longer. It gives motivation for the gym goers to reach their goals and is a useful tool for the gym to communicate with its members." Sony Startup Acceleration Program was first launched in Japan in April 2014 as a start-up incubation ecosystem, which looked to fast track promising new business ideas proposed by Sony group employees into fully-fledged businesses and deliver further innovation. In Japan, 12 businesses have been born from the program activity so far. The program has since expanded into Europe in 2016 where it is based in Lund, Sweden. Advagym is the 2nd commercial business and the 14th business of SSAP in total.